Never mind the NHL’s ongoing historical confusion: the consensus remains that it was Boston coach Art Ross who was first to pull the proverbial goalie in an NHL game. Ever the innovator, Ross was, of course, trying to outman the opposition and tie up a game his team was losing. Tiny Thompson was the ’tender in question on that inaugural essay; leaping to the ice in his stead was Red Beattie. This was in 1931, in a Stanley Cup semi-final, and for the Bruins, a vain effort: Montreal held their lead and won the game, 1-0. Now that we’ve got that all cleared up (again), a few further findings from the last several weeks to expand the pulled-goalies file. 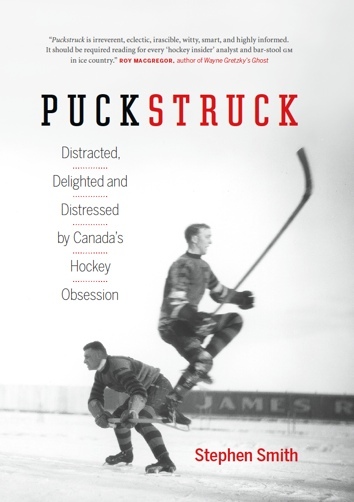 • Windsor Star columnist and hockey biographer and historian Bob Duff has reset the chronology on the first empty-net goal to have been scored on a team with its goalie gone. Previously, Clint Smith of the Chicago Black Hawks was the man widely acknowledged first to have hit a vacant net, on November 11, 1943, in a 6-4 victory over Ross’ Bruins. That’s what the Fame-Hall of Hockey reports in their Smith biography, and it’s in several authoritative books, too, like ‪Kings of the Ice: A History of World Hockey (2002) by Andrew Podnieks, Dmitri Ryzkov, et al. The Hall alludes to a change in league rules at that time, allowing goalie-yanking, but that’s not right: there was never any legislation like that before or after Tiny Thompson’s 1931 departure. Kings of the Ice is mistaken, too, when it says that the practice was seldom used until the 1950s. In fact, coaches whose teams were in need of a late goal didn’t seem to hesitate to try it all through the 1930s, especially if their names were Ross and/or Lester Patrick. Which, when you think about it, makes 12 years look like a long, long time for all those professional hockey players to be not scoring when they had all those unguarded net to shoot at. Cecil pulled the rubber out of a pack near his goal, and after beating every Bruin, belted home the final score with no opposition. From the next face-off Dillon let fly from the middle of the center zone and scored a bull’s-eye on the vacant net. It came with 26 seconds to go. Toronto, always dangerous, was confident that it could score with six forwards, but Joliat hook-checked the puck away from Red Horner and scored the last goal and Howie Morenz almost repeated before the bell. • Six forwards: that does seem to have been the norm in those days. Today a coach might be content to leave his defenceman in place while adding a further forward but in the 1930s, more often than not, teams appear to have been going for offensive broke. Six men are too many to have around the enemy nets. They are sure to get in one another’s way, because there isn’t room enough for them to deploy. And if they should shoot a goal, it’s apt to be called back for interference — somebody between the man with the puck and the goalie. • What about the other end of the ice? Surprising how little has been written about the success stories. The reason you pull your goalie, if you’re Art Ross or anyone else, is to use that extra manpower to score that all-important tying goal. So who was the first to do that? The NHL.com’s paltry historical miscellany has nothing on that, and nor does the Hockey Hall of Fame, or any of the stand-by reference books. At least, if they do, not anywhere that I’ve been able to fathom. It did take a long time for that first goal to go in, as it turns out. Years and years. In today’s NHL, pulling the goalie has developed into a strategy that yields a good return. It’s worth doing; it often works. That’s what the modern numbers tell us, along with the charts on the websites where they’re crunched and glossed, and the studies who’ve made it their business to study the stats. I don’t know how often, exactly, goalies were leaving their nets in hope and desperation in the 1930s because I haven’t done the sifting you’d have to do to figure that all the way out. I can say, anecdotally, that Tiny Thompson was a fairly frequent fleer, in Boston and then later when Jack Adams was calling him to the bench in Detroit. Dave Kerr of the Rangers was another regular, as Lester Patrick’s goaltender with the Rangers. Alec Connell was yanked, in Ottawa. In Montreal, I haven’t myself seen an instance of Flat Walsh leaving the Maroon net, though that doesn’t mean it didn’t happen. George Hainsworth, of the Canadiens, definitely did. Given Bullet Joe Simpson’s feelings, it’s possible that he left Shrimp Worters where he was throughout the Shrimp’s Americans career. So: lots of goalies leaving many nets. And yet the first time the tactic paid off seems to have been in … 1937, five-and-a-half seasons after Art Ross first gave it a go. The newspapers noted the achievement, if only in passing: there was no great huzzah. It seems only fitting that Ross was the one who finally got it right. Tiny Thompson was still in (and out of) the Bruins’ net. 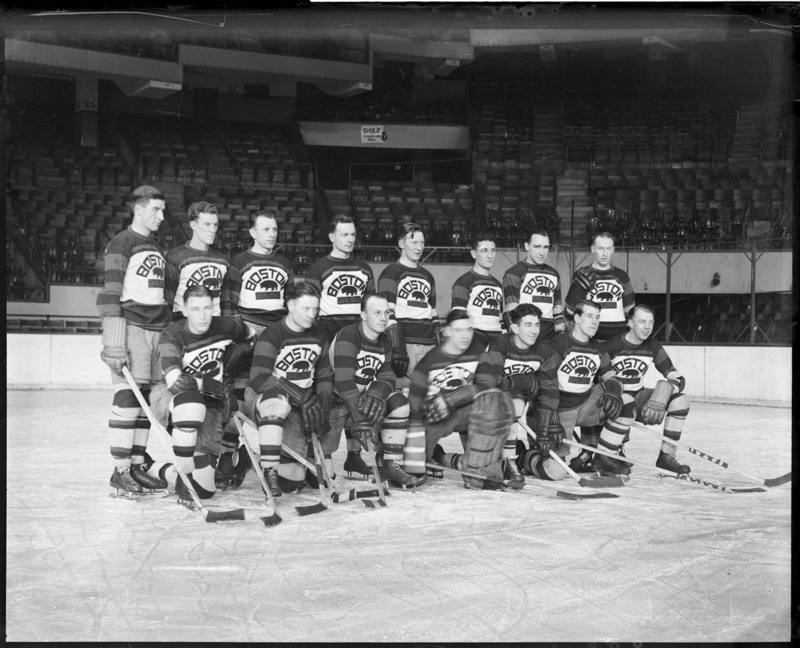 Also of note: five players who were on the ice that first time in 1931 (Boston was shorthanded at the time), four were in the 1937 game wearing Boston colours — Eddie Shore, Red Beattie, Cooney Weiland, and Dit Clapper — while the fifth, Art Chapman, was playing for the visiting New York Americans. Lorne Chabot could have held the New York citadel inviolate with an eclair in either hand. The Amerks were leading 5-1 and 6-4 in the third before Clapper made it 6-5 on a pass from Weiland. Twenty-five seconds remained when Ross called in Thompson. (The Associated Press says 30. Not sure how much I trust the AP account, though, given that it also contains this sentence: “It was probably one of the most weird games in the Boston’s hockey history.”) Boston defenceman Flash Hollett followed his goaltender to the bench to let a forward go on and so (just like in 1931) the Bruins only had five players on the ice and no numerical advantage when Hooley Smith scored the goal that tied the game and made the history that eventually got mislaid. The teams played a ten-minute overtime without any more goals. Neither goaltender, said the Globe, had to make a difficult save. Right until the end, both of them stayed in their nets. • So that’s that. Except for — well, no, not quite. About an hour after I’d tracked down the 1937 Hooley Smith goal, complete with contemporary confirmation that it was unprecedented, I came across a 1933 game in which Eddie Shore scored a goal to tie up the Chicago Black Hawks while (do you even have to ask?) Tiny Thompson was on the bench. So that would be the first time a goalie pulled resulted in a goal scored, no? Yes. I think so. It’s not an entirely straightforward case, though. Boston was in a fight at the top of the NHL’s American Division while Chicago was stuck at the bottom, out of playoff contention. The regular season was in its final week. Here’s how it went on (Montreal’s Gazette) “a topsy-turvy night:” with Chicago leading 2-0 halfway through the third period, Shore scored a regular goalie-in goal on goalie (in) Charlie Gardiner. The Daily Boston Globe report on the game called Shore “the wizard of far-away Edmonton,” which is pretty good. His second of the game came (goalie gone) with two seconds left. And so to overtime. Every player on the ice, with the exception of the Boston goalkeeper, was slashing in front of the Chicago net when Marty Barry drove the puck and it appeared to go over the line. Boston’s Globe said that Gardiner was down on the puck, and his defencemen, too. It also calls him “Jackson” in several key parts of the game narrative. Still, no-one disputes that the red light lit up: goal. The Black Hawks rushed behind the net to tell goal judge Louis Reycroft he was mistaken. To italicize the point, defenceman Art Coulter (CP calls him “Johnny”) poked his stick through the netting “in an effort to jab the official” (Boston Globe). But. Boston. Stewart got the teams back to centre ice after Barry’s controversial goal. They were just about to face off again when Gorman summoned the referee for a chat. When the official tried to calm him, Gorman is alleged to have struck him in the face with his fist. Stewart fought back and the Bruins finally separated them. Linesman Bill Cleary managed to pacify the referee and when he regained his composure he ordered Gorman from the bench. The Boston Globe spun a similar tale, with a few refinements: Gorman threw “a healthy punch,” Stewart tossed one back. There was a rapid exchange of blows and only the strength of Alex Smith who teams with Shore kept Stewart from climbing over the boards. in the midst of the talking, reached over, pulled Stewart’s sweater over his head with one hand and punched away with the other. The Chicago pilot refused to do so and there was more talk with both adversaries trying to reach each other with clenched fists. Shore and Chapman as a matter of form took the puck slowly to the empty cage, Chapman poking the disk in. Stewart then declared the game forfeited in Boston’s favour. Or — well, as The Canadian Press told it, the score was 5-2 when the referee called it. As The Boston Globe understood it next day, the score would actually be entered into the books as 1-0, and they were reporting that in Chicago, too, a couple of days later. NHL President Frank Calder was looking into the whole affair, but he wasn’t going to say anything until he’d heard from all the actors. Mush March came out of it with an injured arm, sustained in a crash with Eddie Shore. [Johnny] Gottselig sustained a badly cut eye. Paul Thompson had several teeth knocked loose. [Roger] Jenkins returned with a sever cut on the wrist and [Billy] Burch is nursing complete and painful set of bruises. The game was on the Tuesday; Calder’s investigative tour brought him to Chicago on Saturday. Well, that was part of it: Sunday, Chicago was playing its final home game of the year against Detroit in what would be the NHL’s very first afternoon game and Calder wanted to see how that went. The face-off was set for 3.30 p.m. and if it worked out — as long as Coach Gorman didn’t yank his team, I guess — the league would look at expanding the practice to all its American rinks, all of which were in cities that permitted professional sports to be played on the Sabbath. A crowd of 6,000 showed up, which is what the Hawks probably would have attracted at night, the Tribune adjudged. Detroit prevailed, 4-2, in bad-tempered, fight-filled game. Billy Burch left with a leg compoundedly fractured. Not sure what happened with Calder’s inquiry. It faded away — out of the papers, at least. The last word I can find is that he was looking to fine (1) Coulter for poking at the goal judge; (2) Gorman for withdrawing his team; (3) Chicago for being the team that employed those two miscreants. A number you see is $1,000 — that would probably have been the team fine, I suppose. None of which has anything to do with goalies pulled/goals scored. On that count, Shore’s does appear to have been the first. So the newspapermen in 1937 … forgot? Of course, if the game was registered as a 1-0 Boston victory, then presumably only Shore’s first goal would be counted. Is that what happened? No. In fact, the game went into to the books as a 3-2 win, so it was a good goal. • Here’s something else, though, if you don’t mind some further straying. This is not to detract from Shore’s achievement that night, let alone the season he was having: he ended up a First-Team All-Star and carried away the Hart Trophy as league MVP. The 27 assists he notched were the most by a defenceman in NHL history. I don’t think, however, that he scored the 8 goals he’s credited with that year. 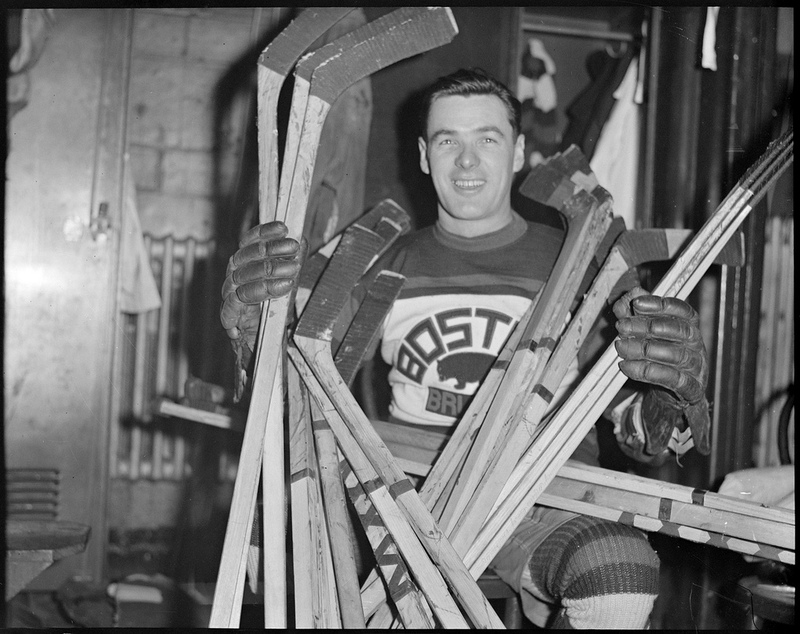 Having combed the Bruins’ 48 games that year, I think he only scored six. If it’s an error, it’s an old one, daring back to the list of leaders Frank Calder released that last week of the 1933 regular season. I’m not saying the president personally got it wrong — although it’s true that he did, as we’ve seen, have a lot on his plate at that time. • Last thing, back to goalie-pulling: Ed Wildey started it all in the first place. Wildey was coaching the Toronto Young Rangers in the OHA in February of 1929. This was at the old Ravina rink, against West Toronto, in a total-goals playoff series. With two minutes left in the game, the fledgling Rangers needed a goal and Wildey called Andy Goldie from the net. First time lucky, I guess: Don Smillie scored the goal the Rangers were looking for. A slight problem: as West Toronto was quick to point out, OHA rules didn’t permit a goaltender who’d been withdrawn to return to the net in the same period. They somehow managed without him. Picked up by other teams, Wildey’s innovation didn’t last: by December of 1929, the OHA voted to ban it. 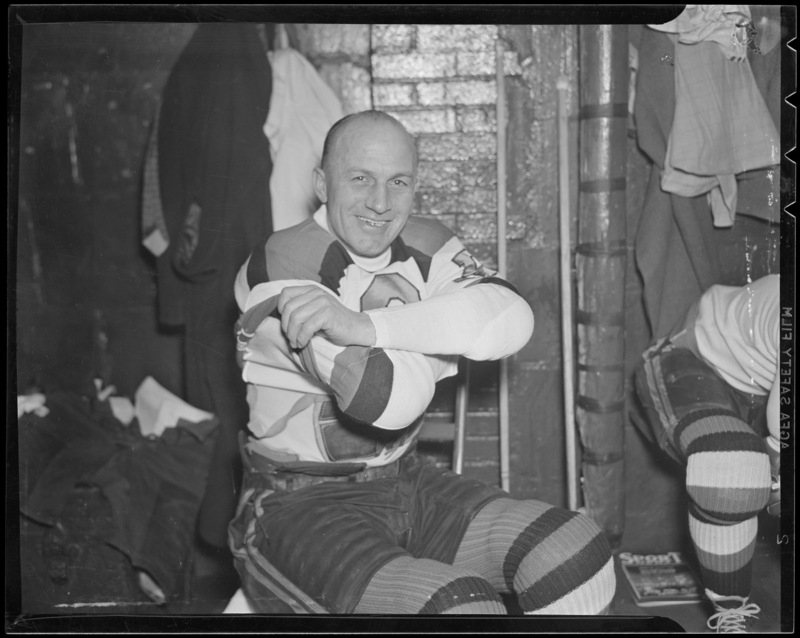 Don Smillie went on the play a season in Boston for the Bruins, so I was going to peg him as the guy who told Art Ross, that seemed smart, except that — well, turns out Smillie didn’t land in Boston until 1933. Sorry.